Power-on Reset (POR) signal that monitors absolute value of three power supplies. POR signal includes programmable delay (during start-up only, brown-out has no assertion delay). Early Brown-out warning (EBW) signal that monitors absolute value of three power supplies. 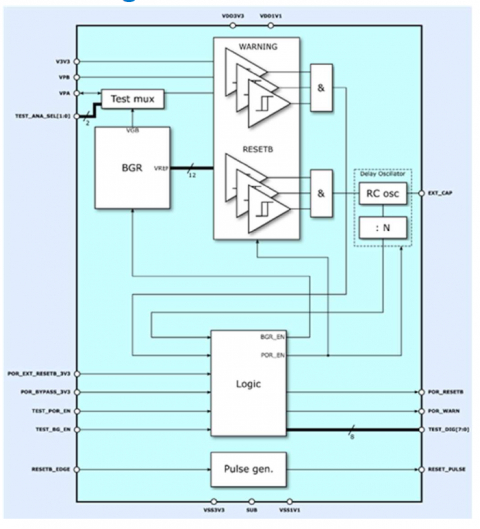 Test mode for easier on-chip debugging. The S3PORT40LP uses threshold-detect circuits to establish the point when it is safe to operate internal circuits. This monitoring ensures that all the power supplies reaches sufficient voltage levels for correct operation. The POR signal may be delayed where amount of the delay is programmable via value of an external capacitor. The S3PORT40LP circuit is implemented in a standard 40nm lower-power process. It is readily portable across all foundries and process nodes upon request.